We are a Linux shop. We tried to pimp gedit with all plugins under the sun in an effort to transform it into TextMate, but no matter what we try it keeps being an awkward coding experience. Still on the search for alternatives, last month we discovered Sublime Text 2 and its entire new way of understanding text editing. I work with multiple major projects in the same week, performing different tasks and roles. I switch environments a lot. Having to think "where am I editing?" before duplicating lines or saving files was messing into my flow. Save, and you will have a selection of finest eclipse shortcuts configured right into your editor. It is as far as I could get without getting into macros. You can help yourself and find the complete list of commands under Preferences > Key bindings > Global, and complement this with our own discoveries. 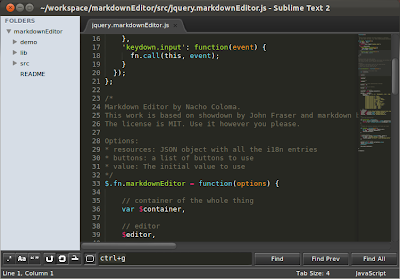 If you like this, do not miss our new post about Sublime Text Editor tips. The behaviour for the the Duplicate Lines ctrl-alt-down command can be more accurately matched to the Eclipse version (that dupes whole lines, not just the selected text) by defining a macro that selects the lines in question first, then executes the duplicate.